While quinoa is often touted as a super healthy way to create a meal, it can be a challenge to impart flavor into quinoa-based dishes. We invite you to tempt your taste buds with this delicately spiced quinoa dish. It gets its sweetness from mangos and bright, herbal flavor from cilantro. Pro tip: If cilantro doesn’t agree with your taste buds, try parsley or basil instead. We love the creamy, crunch that cashews bring to the dish. You can boost their flavor by toasting in a hot, dry skillet for three to four minutes, stirring frequently until the nuts begin to turn golden-brown. 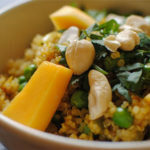 This curried quinoa recipe makes a hearty portion, so it can be served as a main or as a savory side with chicken or fish. Tempt your taste buds with this delicately spiced quinoa dish. It gets sweetness from mangos and bright, herbal flavor from cilantro. Add onion; cook, stirring frequently, for 3 to 5 minutes, or until translucent. Add ginger, garlic, curry powder and salt; cook, stirring frequently, for 2 minutes, or until fragrant. Add quinoa and peas; cook, stirring frequently, for 2 minutes, or until well mixed and heated through. Remove from heat; let stand for 5 minutes. 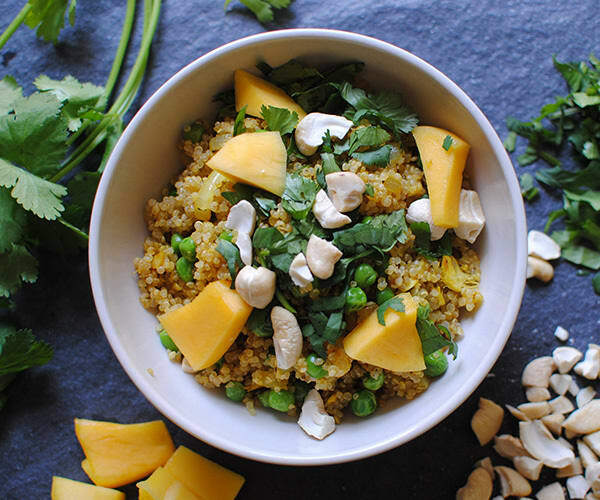 Stir in cashews and cilantro; serve warm topped with mango. Tip: 1 cup uncooked quinoa generally yields 3 cups cooked quinoa. As a convenience, you can cook some in advance, store in the refrigerator, and use for up to 4 days.